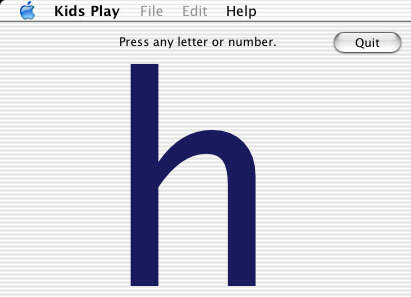 Kids Play is designed for small children who are still learning their letters. It runs in full screen mode and has options for disabling the menu bar. This version runs on both Classic MacOS and MacOS X. What does it do? When any letter or number is pressed, it displays and speaks the key that was pressed. Pretty simple. Order Online - Individual License.